Should You Get the Taotronics LED Grow Light? 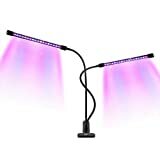 Grow lights help the plants grow faster and healthier. It can reflect at different spectrums and wavelengths, which causes the plants to respond appropriately. 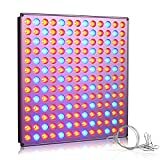 If you are looking for a LED grow light, you can consider the Taotronics LED Grow Light 240W. It has a lifespan of up to 50,000 hours and can fit a standard E26 socket. The grow light has 12 LEDs in a small bulb. It’s easy to set up as it doesn’t need any unique tool or a lamp. The grow light comes with a 12-month warranty, so you don’t need to worry about your investment. If you are not satisfied with its performance, you can get a replacement or refund. 1 Should You Get the Taotronics LED Grow Light? The Taotronics LED Grow Light covers about 6′ of the grow area. All plants within the coverage area receive an equal amount of light from the lamp, so you don’t have to allocate space underneath the grow light for your favorite plants. The extensive coverage also prevents crowding issues. The full spectrum 6 band light produced by the grow light can provide the plants with the energy it needs to grow properly. The UV has a wavelength of 380nm, white light 12000k, infrared 730nm and red light 630nm and 660nm, so the plant can definitely handle the vegetative and flowering phases of its growth cycle. The Taotronics LED Grow Light is safe to use indoors. You can use it to grow indoor marijuana plants without worrying about your health. The grow light has been tested by the right authorities. It’s 100% safe for use on consumable plants and around humans and pets. Devices that produce light can get extreme. You don’t need to worry about overheating because the LED Grow Light from Taotronics is equipped with 3 built-in highly efficient cooling fans that work together to dissipate heat. The grow light will work efficiently for hours without the risk of overheating. No matter how long you use the device, you’re rest assured that it will still perform well. Plants use sunlight to synthesize its foods through photosynthesis. In order for the plants to grow properly, it must absorb electromagnetic rays. However, ordinary LED bulbs can’t provide this. 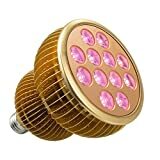 The Taotronics LED grow light produces rays with electromagnetic properties similar to the sun. The plants will absorb 98% of the rays being produced by the grow light and continue to grow strong and healthy. One of the best things about the Taotronics LED Grow Light is that it helps you save up to 90% of energy. The grow light ensures that the plants will continue to grow even without sunlight. The intensity of light being produced is appropriate for every stage of plant growth, so you don’t need to adjust any switch on the device just to get your desired results. Another benefit of the LED grow light is that it is user-friendly. No matter how powerful a device may be, if it harms the environment, you will not be interested in buying it. The Taotronics LED Grow Light emits light at different wavelengths, but you don’t have to worry about any adverse effects to your health because the lamp is entirely safe. It doesn’t pose any harm to humans. Grow lights are an essential piece of equipment that aspiring marijuana growers should have. These devices are easy to use, but you should still take good care of it so that it will last for years. For instance, you can connect the lights to a power stabilizer to balance the incoming voltage and protect the chips inside the LEDs. There are also other factors that must be considered when growing marijuana indoors such as nutrients, soil, room temperature, plant genetics and airflow circulation. Knowing how everything works can help you get large and healthy yields. The 240W LED Grow Light from TaoTronics is a good option for beginners and those who want to grow a couple of indoor plants. It’s available in 3 models – TT-GL23 (36W), TT-GL20 (12W) and TT-GL22 (24W). The grow light is efficient, environmentally friendly and affordable. It doesn’t consume a lot of electricity, so you don’t need to worry about your monthly bills. The grow light’s excellent energy output makes it an excellent choice for first-time growers. Thanks to the 6 band spectrum, you don’t have to fiddle with a switch to change the kind of kind being emitted. There’s also no need to arrange the plants or rotate the light source in any particular way because the grow light can cover a large area. Its built-in cooling fans work continuously to prevent heat build-up. With all these benefits, you should definitely consider the TaoTronics LED Grow Light when you’re planning to grow cannabis at home. Here are some of the other models by TaoTronics.